PHUKET: News involving the Immigration Bureau over the past two weeks could have fooled anybody that April 1 had come early. 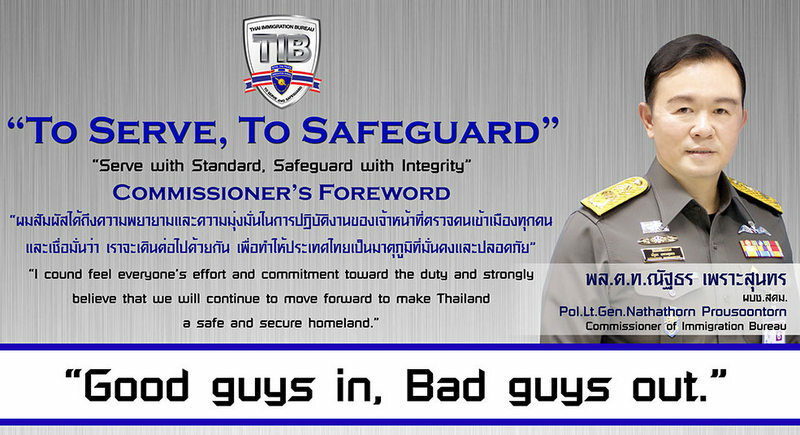 Lt Gen Nathathorn Prousoontorn's new Immigration Bureau motto, 'To Serve, To Safeguard'. Many foreigners will have figured out by now that this actually means that the rules do not apply to foreign children under 18 still within the country. Yet the icing on the gaffe cake was the data breach of the Nakhon Sri Thammarat Immigration Office that exposed private information of thousands of expats and tourists in the South (see news pages). To be fair, the Immigration Bureau is not alone in having its data exposed, as dozens of government websites’ insufficient security has been made public mockery by hackers in recent months. In respect to the re-entry ban not affecting minors, it is pitiful that Phuket Immigration was unable to provide a single officer who could respond on the record to clarify the rules. After all, the Immigration Bureau is, as they will very quickly remind when enforcing the law, an entire division of the Royal Thai Police. The sad irony linking the two incidents, however, is that all this has happened in a country whose Prime Minister repeatedly vows to fight corruption. At the same time, the powers that be have introduced the Computer Crimes Act, which allows up to 15 years jail be imposed on people who post on the internet any information “likely” to cause harm to another and willing to use this law even on Facebook “Likes”. In case people aren’t aware of the definition, corruption requires an official to be involved. Yet, holding officials responsible for the consequences of their actions, or inactions, remains rare – like trying to sue the Highways Dept for an accident caused by a pothole in the road. It seems that for the time being, expats and tourists will just have to take it for granted that the “law” is exactly whatever the officer standing in front of them says it is… unless of course a superior officer says something different. NCPO now 2 years in charges. What reforms have reached and are visible to the thai people about corruption of government officials? In hierarchical class society as Thailand is, the thai people want no corrupt police officers and government officials. These 'authorities' have to be a sample of good and correct behavior. As normal the law of the Baht. Nothing changes except the face saying everything is different now.